What is IT Band Syndrome, and How Can I Treat IT? Iliotibial Band Syndrome (ITBS) is one of the most common overuse injuries among runners, but what exactly is it? 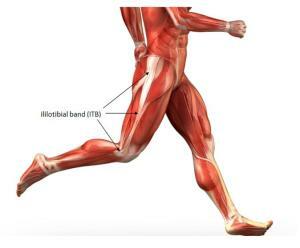 The IT Band (ITB) is a long, thick, fibrous band that runs along the outside of your leg. It starts at your pelvis and ends right below your knee. Athletes like runners or cyclists that flex and extend their knee repetitively can develop pain on the outside of their knee because of the friction between the ITB and their knee. If you have weak hip muscles, particularly the gluteus medius, you are increasing susceptible to suffering this kind of injury. Other factors like pronated foot position, poor running mechanics and poor training habits also increase the likelihood that you may fall victim to ITBS. In order to help prevent ITBS there are a few things you can do. First make sure you have a good running shoe, if the shoes you are wearing are worn out or are not supportive enough for your foot type then you should look into upgrading your footwear. Next correcting any flaws in your running mechanics can make a big difference by decreasing friction between your ITB and knee. A proper warm up and a hip/core strengthening program is always beneficial for runners, but become even more important when trying to prevent ITBS. There are some misconceptions out there when it comes to dealing with ITBS. For starters it is very hard to stretch the ITB, if not impossible. Like we said before the ITB is a thick fibrous band, almost like a leather belt that runs along the outside of your leg. It does not have a lot of the structural properties, like a muscle does, that would allow it to stretch. Imagine trying to stretch a leather belt, you can pull and pull, but you probably aren’t going to be able to make it any longer. Now you may feel a stretch in the surrounding muscles if you try an ITB stretch, but you are not likely stretching the ITB itself. Another thing that may be recommended is cycling to keep up cardiovascular training while you are dealing with ITBS. The problem with this is that you are still flexing and extending your knee through a range of motion that can create more friction between the ITB and the knee, which can hinder the healing process. If it’s too late to start an injury prevention program and you are already suffering from ITBS, there are a few things a physical therapist can do to treat it. Rest and ice are the first steps in dealing with ITBS because they can help decrease the inflammation that is present. Soft tissue work, like the Hawk Grips technique we use at Prue Physical Therapy & Sports Performance, or foam rolling can help some patients by decreasing their pain and helping the healing process. It’s important to note the purpose of these activities is not to lengthen or stretch the ITB. Finally once the pain has started to subside, strengthening your hip and core muscles will help get you back to activity and help prevent the problem from reoccurring. Strengthening your glute medius is the NUMBER ONE thing you can do to help treat and prevent ITBS. There are a few different exercises designed to target the glute med, but for runners it’s important to start with some of the basic exercises and progress to exercises that mimic the mechanics of running. Here is an example of a good beginning glute med strengthening exercise. You can view more examples of exercises in our exercise video library. When the time comes to return to running, start with some interval training where you sprint or run a short distance followed by a period of walking. This will allow you to build your mileage back up slowly and help prevent from having a painful relapse.